Women in Refrigerators is a term coined by comic book writer Gail Simone to describe a supposed tendency in comic books for female characters to be killed, tortured or maimed in order to further a male characters story. The term comes from a notorious issue of Green Lantern where the characters love interest is literally stuffed into a fridge by his archenemy. Whilst originally meant to simply highlight the trend of female characters being expendable in comic books, women in refrigerators has since become used to refer to other similar examples in film, television and even video games. I used to think the women in refrigerators trope was reasonable. I even agreed with Whovian Feminism that Osgood had been fridged, but in recent months I have come to see it as another example of people looking at things one way with male characters and another more negative way for female characters. In this article I am going to debunk this old trope. I don’t think it is entirely without merit, but by and large I think this criticism is hollow and a double standard that needs to die. Personally I do not agree that any forms of entertainment can influence someone to be a killer. Whilst I can’t say that for sure, its worth noting that there is absolutely no evidence for people like Sarkeesian’s claims that video games (and for that matter other forms of entertainment) influence people towards violence or even racist or sexist thoughts. So personally I don’t think violent comic books are in any danger of producing a generation of woman hating psychopaths! On top of that I also feel that women in refrigerators is a double standard. When you look at female dominated series such as Xena, Charmed and Nikita you can see many examples of male characters being killed, tortured and maimed in order to further the main female characters story. In Xena 9 supporting male characters are killed off in 6 seasons. Compare that to Spider-Man that has killed off two female characters in 50 plus years. Male characters that are killed off in Xena to further her and Gabrielle’s stories are, her brother whose murder helped to drive Xena down a dark path. Her father whose murder also put a strain on her relationship with her mother. Her one true love Marcus (who dies twice), her first husband who sacrifices himself, her lover from her dark days Borias, Joxer her bumbling sidekick, her son Solon, her son Solon’s adopted Centaur father and Gabrielle’s husband, Perdicus. In Once Upon A Time the three main female characters all have male loved ones who were killed off to further their story. Regina the evil queen who was driven down a dark path when her one true love was killed off. He is in a later episode brought back to life as a Frankenstein’s monster, only to be killed off again! Snow White’s father meanwhile was murdered by the Evil Queen which marked the beginning of their feud. Similarly Emma, the main female protagonists love interest Bae is killed off in the shows third season too. In Nikita a supporting male character Birkhof is brutally tortured by her nemesis Amanda, who also cripples him by smashing his thumbs. Her love interest Michael meanwhile also loses his hand too. In Buffy the Vampire Slayer, Xander Harris gets his eye gouged out by the deranged priest Caleb too, which is comparable to Barbara Gordon as Batgirl as both characters were crippled, disfigured. In Charmed meanwhile Pru’s love interest throughout the first season Andy is killed off in the season 1 finale, whilst Phoebe’s love interest in season 3 Cole is similarly later killed off in season 5. There are many more examples from other female dominated series, yet no one ever comments on these works being anti men. Not that they should of course. There is noting anti men about killing off a fictional male character for the purpose of advancing a story, but still you can see what I mean about how this is a double standard as apparently killing off fictional female characters for the purposes of advancing a story is misogynistic. When you look at the following two famous examples of a supporting male character being killed off in a female dominated series, Xena the Warrior Princess, and a supporting female character being killed off in a male dominated comic, Batman. You can see more clearly how there is a real double standard in common “Women in Refrigerators” complaints. These two adventures follow the same basic story, yet one is routinely derided as a piece of sexist trash, whilst the other is not controversial at all. In the Xena episode, Return of Callisto, Xena’s archenemy slaughters Gabrielle, Xena’s best friend’s husband right in front of her. Callisto hopes that this will drive Gabrielle insane just as Callisto was by the death of her family at Xena’s hands. Callisto’s family were burned to death in front of her when as a child Xena’s army attacked her village and accidentally caused a fire that burned the village to the ground. Though Gabrielle comes close to murdering Callisto in her sleep, ultimately she can’t go through with it, showing Callisto that perhaps its not all Xena’s fault that she became a monster. Gabrielle endured a similar loss yet remained the same decent person she always was. In the classic Batman comic, The Killing Joke; the Joker wants to prove that one bad day is all it takes to drive the sanest man alive to lunacy. We discover through flashbacks that the Joker was originally a failed comedian, who planned to help two criminals rob a chemical plant he worked at in order to provide for his pregnant wife, Jeannie. Sadly however not only was Jeannie killed in a freak accident before the robbery, but when robbing the plant, the un named comedian was accidentally knocked by Batman into a vat of chemicals that bleached his skin white, finally pushing him over the edge and driving him insane. In the present the Joker shoots Barbara Gordon through the stomach in front of her father Commissioner Gordon and strips her, takes pictures of her naked body, and later shows them to a captive Gordon whilst torturing him to drive him mad. Gordon however remains sane, ultimately proving to the Joker that normal people don’t become monsters because of one bad day. Perhaps the darkness was always there lurking inside him somewhere waiting to come out. Now whilst I would personally regard both stories as classics and both are very highly regarded by most fans of their respective franchises, The Killing Joke has also been highly criticised for being sexist because of how it treats Batgirl. Question is why? How is it any different to the Return of Callisto? In fact ironically it seems very likely that it inspired the Return of Callisto as obviously the makers of Xena were big comic book fans. Both stories revolve around a psychotic, giggling arch villain that was driven insane because of one bad day, that involved the death’s of their family. Both villains were also in a way created by the hero too. In both stories the psychotic villain wants to prove that anyone could be a monster like them and so they attack someone close to one of the main characters to make them snap. In both cases however the person, Gabrielle and Gordon don’t crack and the Joker and Callisto are forced to come to the conclusion that they are more responsible for their actions than they thought. Yet apparently when the cackling villain, supporting character who loses a loved one, and main hero roles, are all occupied by men, and the victim role is occupied by a woman then its sexist, but not the other way around? In the second article the author claims that the only critics of his opinions about The Killing Joke were men. Well for the record the person who helped me run the “Petition to Get Mark Hamill To Play The Joker In An Animated Killing Joke” was a woman! Now if the team behind the Xena remake decide to do their own version of The Return of Callisto (which they should as that is an amazing storyline), will they have to put up with constant complaints that this story encourages violence towards men? Will they have to deal with people boycotting all Xena related products for promoting a supposed dated, misandristic story? Will they even have to pull certain aspects of the story, so as not to offend any whiny MRA’s? No of course not. 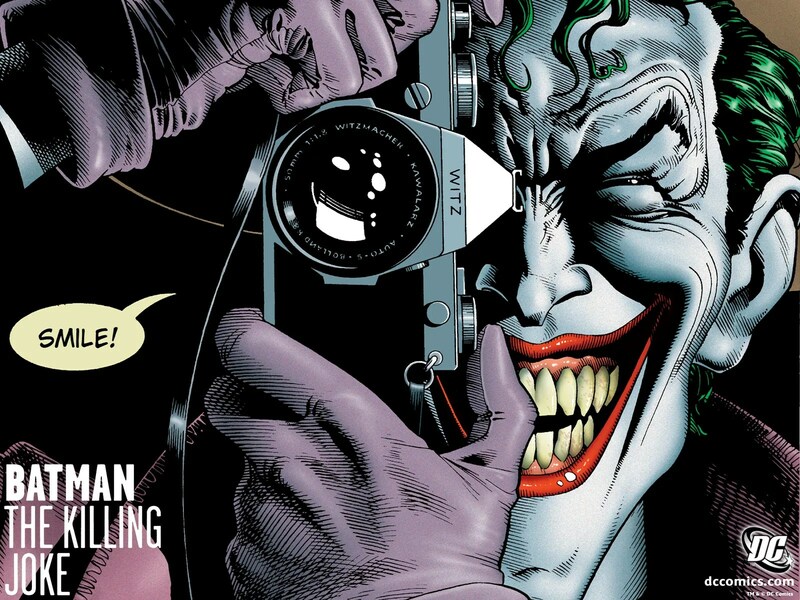 It would be utterly ridiculous if they did, so why then does The Killing Joke get such treatment? Its a double standard plain and simple. Why should the writers of male led series not be allowed to use a particular trope, but the writers of female led series are because of the main gender of the hero? I freely admit I have been guilty of this attitude in the past when I criticised Steven Moffat for using a supposedly “sexist trope” in killing off Osgood, but praised the makers of Xena for creating a powerful drama in killing off Perdicus. It never occurred to me that it was a double standard but it was. Its an old trope that in order to sell a villain as a threat, or to raise the stakes you have the villain kill someone close to the main hero. Gender doesn’t really enter into it at all. In something starring a straight male hero, chances are the most important person to them will be a woman. Their wife, their daughter etc. In something starring a straight female hero meanwhile chances are the most important person in their life will be a man, their husband, boyfriend. Of course that’s not always the case. In many male led franchises there have been just as many supporting male characters killed of as women, in some cases more. In Angel, Spider-Man and Supernatural there have been just as many major male supporting characters killed off. Spider-Man’s Uncle Ben and the father of his first love Gwen Stacey both famously met tragic ends. You could also count Harry Osborne in the films. I wouldn’t count him in the comics as he was a villain in them, but in the films he redeems himself and still dies. In Angel meanwhile two main female and two main male cast members are killed off over the course of its 5 year run, Fred and Cordelia, and Doyle and Wesley. In Supernatural meanwhile there has been an equally large amount of male and female supporting characters killed off over the course of its run too. In Firefly, a male led franchise more male supporting characters are killed off, Derrial Book and Wash. In the original Star Trek if you include the films, the only two recurring or main characters to be killed, were two men Spock (who got better to be fair) and David, Kirk’s son. In Smallville meanwhile 4 main male cast members were killed off over the course of its 10 year run, whilst only one female main cast member died. In Buffy on the other hand, a female led series, ironically more female supporting characters were killed off than male. Jenny, Giles love interest, Tara, Willow’s one true love and Anya, Xanders former fiance. But that’s the point gender doesn’t matter. The trope exists as seen with Willow and Tara, Gabrielle and Perdicus, and Peter Parker and Gwen Stacey regardless of gender or sexuality. Now whether you think its lazy story telling, or a waste of good characters like Osgood, Tara and Batgirl is another matter. Personally at the time before she was brought back I did feel that Osgood’s death was a waste of a good character, but again that doesn’t mean it was sexist in the slightest. Many feminist critics have argued however that we see more female supporting characters killed off than male overall and thus its not specific examples that need to be scrutinised but rather the trend as a whole. This is a more fair point, and I certainly wouldn’t disagree that there are more male heroes. Though I think by and large including all one off’s, villains and supporting characters, more men are actually killed than women in all forms of entertainment, though more on that later. Still yes at one point it was true, particularly in comic books that main female characters would be more likely to be the love interest or sidekick and thus more likely to be “fridged” and that was bad. Times move on however. In the last 20 years alone we have had dozens of female heroes emerge in various forms of media, film, television, video games, comic books to massive acclaim. Arguably the most successful original characters in the fantasy genre of the past 20 or so years have all been women. Buffy, without doubt one of the greatest ever icons, easily on a par with the Doctor or Captain Kirk. Xena another global icon, so popular they named a planet after her. The Charmed ones were until just last year (when Supernatural surpassed them) the stars of the longest running fantasy series in American history! Now in all fairness Marvel and DC are still feature predominantly male heroes. The reason for that however is because most of their characters were created in the 30’s, 40’s, 50’s or 60’s and have stuck around since then. Characters like the Joker, Superman, Batman, Spider-Man, Captain American etc are deeply set in popular culture and are naturally going to get more exposure than any new female heroes or male heroes for that matter. Obviously sometimes a new hero can end up becoming as iconic as the classics, like Wolverine who was created much later than many of the rest of the X-Men, but is now the most popular, or Ra’s Al Ghul a major Batman villain who was created in the 70’s. However generally speaking most of the main DC and Marvel roster were created decades ago and thus naturally most of them are male. Overall however I don’t think it can be said that female heroes are a rarity in the sci fi and fantasy genre in the modern age. As time goes on we will see more and more female heroes. Yes the old established heroes from the 30’s, 40’s and 50’s etc are mostly male, but that doesn’t matter. Keep those heroes, but just move on and create new female ones. I think that nowadays too many feminist critics are focused on attacking male dominated franchises rather than encouraging people to not only create more female dominated ones, but pay attention to the existing female led classics such as Xena and Charmed. Why bother attacking The Killing Joke for being sexist instead of reviewing and trying to bring attention to The Return of Callisto? Many feminist critics have argued that more male supporting characters who are killed off, or maimed and tortured are often brought back to normal. A famously cited example is Jason Todd, the second Robin and Barbara Gordon. Jason Todd was beaten to death by the Joker. 10 or so years later however, Jason returned from the grave, whilst Barbara remained in a wheel chair for over 20 years. This is often referred to as Dead Men Defrosting. However I find this to be a bit of a myth too. What a lot of people fail to mention about Jason is that yes, he did return from the grave but he became a psychopath, and killed people. Okay Barbara remained in a wheelchair, but she was still herself. If anything she became even more of a hero after her accident as Oracle and certainly lived a much happier life than poor old Jason. Its ironic that so many progressives apparently see being a disabled hero as worse than being a psycho killer! Other famous supporting male characters like Captain Stacey, Uncle Ben and Thomas Wayne, bar the odd time travelling mistake or visit to an alternate universe have stayed dead too. Also many other examples of Dead Men Defrosting such as Barry Allen are different as those are main characters. Barry isn’t just somebody’s father or love interest. He was the Flash, arguably the most iconic version and so its natural that he would return more than say Gwen Stacey. Many feminists have argued that female lives are seen as more expendable and that their deaths or even torture scenes are often more explicit and gorier than male ones which again is not true. Its male villains that Batman will often be more likely to violently assault than female ones. Who were the three villains he violently killed in the original film series? Joker, Penguin and Two Face all guys. Even just the mooks he kills in the films were all men, and it will almost always be male mobsters that he beats up, tortures for information or even just terrorises in other versions of Batman. Also on top of that men make up by far more, get killed on the planet guys, victims of the week, and red shirts than women do. In the original Star Trek series there is only one female red shirt in the entire series. The rest are all without exception men! Similarly in the original series of Doctor Who, there was only one female UNIT soldier killed in the entirety of the classic series. It was in the story Battlefield and I might add was given a lot more focus than the majority of male UNIT soldiers deaths are. The actress who played the soldiers killer, Jean Marsh even said she found the scene distasteful (though necessary to establish how evil her character was) and didn’t enjoy doing it. No women are killed by the Daleks onscreen (the most evil of all the Doctors enemies) until their 6th story, the Power of the Daleks. In The Dalek Invasion of Earth we briefly see a woman being struck by a Roboman, but other than that all of the Daleks victims are guys. I might add that there are major female characters in every single Dalek story bar Mission to the Unknown before The Power of the Daleks. After The Power of the Daleks it wouldn’t be for another 13 years until we saw the Daleks kill another woman onscreen and there are major women characters in every Dalek story in between too. The Daleks only kill women in 4 stories in Classic Who. The Cybermen, the Doctors other longest running adversaries only kill 2 women on screen in the entirety of Classic Who. The Sontarans meanwhile kill no women on screen in Classic Who. In the Spider-Man film series, only two women are killed on screen in the original Sam Raimi trilogy. 18 men meanwhile are killed onscreen throughout the trilogy. In the original Batman film series, only 4 women are killed on screen (not including scenes where the whole crowd is gassed and hundreds of people are killed at once or the two models the Joker killed offscreen). In contrast 19 men by my count are killed on screen across all 4 films. Almost 5 times as many. In the X-Men film series meanwhile, far more women are killed on screen than in other film series. However that’s to be expected as not only does it have more female characters, but the darker “everybody” dies tone of the films such as in Days of Future Past (before its reset) means that more women are likely to be killed. Even then however more men are killed on screen by far. Take a look at this scene alone More men are killed in this one sequence than women are in the entire film series. Male deaths are not only more common on screen in male led series such as Batman, but also female led ones such as Xena. Not only are far more male supporting characters killed off in Xena, but far more major villains, and indeed almost all of the mooks she slaughters are male. Similarly in Buffy the majority of the Vampires and Demons she stakes, the majority of the victims of the week and her major enemies, are male. In Charmed almost all of the three sisters enemies are male too, and again so are a good percentage of the victims of the week. Far more men are killed across all major franchises in all mediums on screen. A female characters death is often treated more seriously and never usually just as a grunt or red shirt. Finally I don’t think that female characters deaths are any more gruesome than their male counterparts. Take for instance this scene from Nikita of Berkhoff being tortured by a female villain. I don’t think you can say he gets off easy in this scene because he is a man! Birkhoff is benefiting from white male privilege it seems. Why Does This Myth Persist? I think the women in refrigerators myth continues to perpetuate ironically due to ignorance of female led series. I’ve noticed that many feminists ironically have 0 interest in female led series such as Charmed, Xena, Nikita, Once Upon A Time, Alien, Earth 2, Dollhouse, Ghost Whisperer, Alien etc. So many feminists instead seem to focus their attention on male led series such as Batman, Doctor Who, Merlin etc, such as Claudia Boleyn. Claudia Boleyn is a lovely person all around. On twitter and on youtube she is always polite to people she disagrees with, and never tries to censor other people’s opinions. I also do find her videos interesting (even if politically she is on the opposite side to me in some respects. Its nice to hear the other persons perspective). Yet still I’ve noticed that the majority of the shows she talks about are male led. Now again I am obviously not saying that means she hates female led shows, but I find it odd at the same time that someone who claims that she cares so much about seeing people like her on television, has never even mentioned Xena, a show that stars two bisexual women! Of course Claudia is not alone. Whovian Feminism is similarly another feminist who focuses all of her efforts on a male led series, obviously as her name would suggest. Ditto Paul Cornell, a feminist who claims he cares passionately about female representation, yet never even mentions the likes of Charmed, Buffy, Xena, Nikita etc. Instead all of these people are focusing their efforts on trying to prove that male led series are sexist, again seemingly for starring men! In my opinion if these feminist and progressive fans want to actually help bring about representation to women then they should do the following things. 1/ Create new female characters. I honestly do not believe there are any barriers to that in the modern world. Charmed alone was at that point the longest running fantasy series in American history. 2/ At least try and draw more attention to series like Xena, Charmed, Buffy, Earth 2, Ghost Whisperer and others by reviewing them instead of just finding new ways to attack male led series for doing the same things that female series do, like killing off supporting characters to further the main characters story. Thanks for reading. Let me know what you think in the comments below. I appreciate that this might be seen as a rather controversial stance to take on this issue, but I stand by my points and I would like to hear other people’s perspectives on this. Very well stated and researched. I whole heatedly agree that feminism needs to focus on building women up rather than pulling men down. All that does is lower the bar all around. There are strong female characters in every form of entertainment from Rogue and Storm of the X-Men to Dutch in Killjoys, from Aeryn Sun and Chiana in Farscape to Hermoine Granger in Harry Potter. This current wave of identity politics has made characters nothing more than their race, gender, or sexuality label. They need to build a personality and a back story. Give the characters depth and intrigue. I am a white male and I enjoy characters of every sort. Reading, watching, playing characters that are just like me all the time would get terribly boring. We need to work towards removing the labels. It doesn’t matter what we are, it matters who we are.